Seeking professional Company Drivers & Owner Operators with Tractors today! 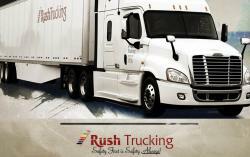 Rush Trucking, focuses on their drivers and what you need to succeed. Rush Trucking is a world-class minority owned trucking and freight Transportation company founded in 1984 by Andra M. Rush, Native American. Headquartered in Wayne, Michigan, Rush Trucking is an industry leader for cost effective truckload and milk-run transportation for short-haul, long-haul, and just-in-time operations. We have a lot of new changes with Rush, and we are excited for the up and coming new changes. The focus is our drivers and for Rush to grow. We offer an excellent driver benefit package, great pay, and an atmosphere that makes our company drivers and owner operator partners feel like family. Rush Trucking is currently seeking professional truck drivers for dedicated lanes, general commodity routes, pop-up fleets, and auto transport carriers.